Between fall festivals, parent teacher conferences, soccer tournaments and end-of-year capital campaigns, the autumn planning season is humming. 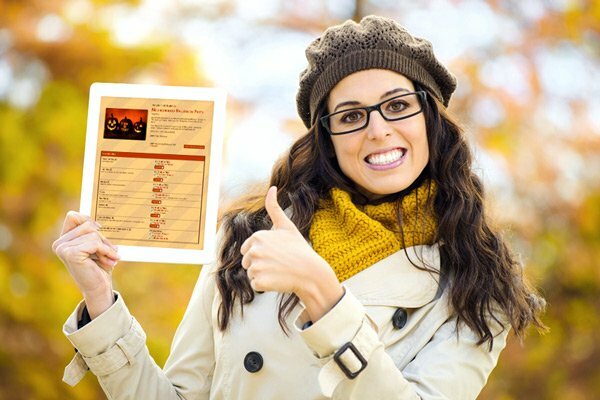 Looking at everything you’re coordinating, it is no surprise fall is the busiest time of year for SignUpGenius users! That’s why we’re here to streamline your communications and organizing — whether that means planning the perfect class Halloween party or rounding up your workers for the annual flu clinic. SignUpGenius can help you tackle even the toughest project with no worries. Just look to our planning resources for inspiration. Schedule parent teacher conferences in a snap with our How-To Guide. Plus, check out a sample sign up and get our handy P/T Conference Checklist! Host an outrageous costume party for Halloween or be the nicest witch in the neighborhood when you throw a killer block party! Recruit volunteers and raise money for your school with a book fair or fall festival. Sell tickets for the fall musical using a sign up, and streamline payments and fee collection with SignUpGenius Payments. Root, root, root for the home team with a perfectly executed tailgate party — you’ll look like a pro with a sign up! We might not have candy for you, but our sign up tools are even better! SignUpGenius offers the customization and personalization needed whether you’re running the church food drive or a multi-day festival. Check out these great sign up ideas! Master the art of sports parent multi-tasking by organizing snacks and carpools for your team. Get your church small group in a groove with a bible study sign up and easily coordinate snacks, too! Find volunteers to help throw a spook-tacular Halloween party at school! Earn brownie points when you organize a work potluck or community service event. Browse our new themes for a fresh fall look for your sign up! From jack-o-lantern images to football pics, we've got you covered! Don’t pull your hair out this fall when the events start piling onto your calendar. SignUpGenius will have you smiling while you work through that to-do list! Need an extra hand this month? 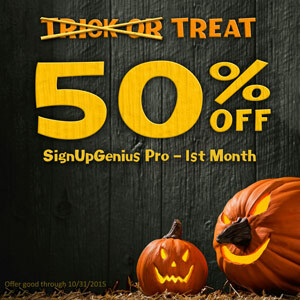 There’s nothing scary about getting your first month of SignUpGenius Pro half off! Plus, watch our Facebook page for more special treats throughout October!